Elevate your fashion and glamour quotient with this kurta from Gerua. 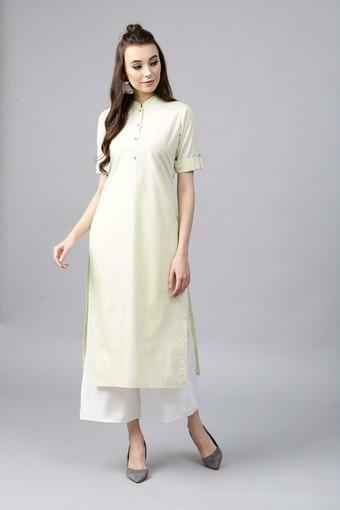 Fashioned using cotton fabric, this kurta will not fail to catch your fancy at a single glance. Featuring a mandarin neck, rollup sleeves and solid pattern, this kurta holds a superlative enticement. Bring home this kurta, which will be a great choice for casual occasions. Style this kurta with a pair of salwar and an attractive contrast colour beaded bag to liven up your attire.